Football season is in full gear around here. We're cheering on our favorite teams (c'mon Peyton, we NEED you! ), I'm cooking up a big pot of chili this weekend, and our city is even preparing to host the biggest of all football celebrations, the Super Bowl! 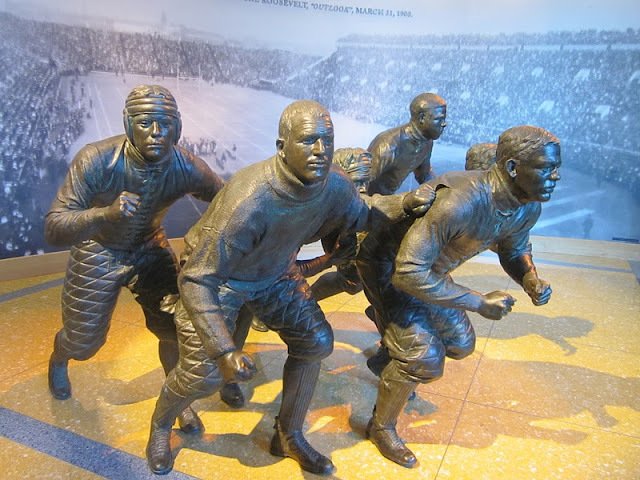 If you're visiting Indianapolis with kids, particularly those interested in sports, the NCAA Hall of Champions would be a great spot to burn off some energy! Open Tuesday-Saturday, 10-5, and Sunday, 12-5. Adult admission is $5. Kids 5-18 are $3. 5 and under are free. Like what you see? Then "like" Arrows Sent Forth on Facebook! And speaking of fun attractions in Indianapolis, I've got a great giveaway planned for next week if you live in the area. Be sure to check back and enter! Disclosure: I was invited to tour the NCAA Hall of Champions as part of a White River State Park press trip, which included my admission. I was under no obligation to write about my time at the museum, and all opinions expressed are my own. I had no idea that there was a museum devoted to the NCAA - looks interesting! Seriously cool museum - my sports loving boys would love this!